Depending on your school-going child’s age they will probably need anything between 9-12 hours of sleep every night. A four year old will probably need the full 12 hours of sleep, whereas a 16 year old can function well after sleeping for about 9 hours. As a parent you will need to figure out how much sleep is appropriate for your own child and try to ensure that they get the required amount every night. Your child is getting the right amount of sleep if they can go to bed, fall asleep easily (usually within 15-20 minutes), can wake up easily, and is awake and alert throughout the day. To find out how your child functions during the school day you can check with their teacher. Teachers report that many school children are sleep deprived and some even fall asleep in school. Make sure you are consistent with your child’s bedtime. 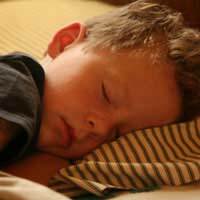 Children often compare their own bedtimes with friends, and, if they find they are going to bed earlier than their peers, will probably bring this to your attention. Remain firm and explain that you have chosen a particular time for them to go to bed every night because they need a certain amount of sleep to remain healthy and energetic. Your child will feel better and find school easier to cope with if they sleep well at night. For younger children make bedtime a special time – a time where you interact with your child in a loving and special way. Be firm and consistent about the time that they go to bed but make it enjoyable for them by reading a story or playing a quiet game with them. You may want to give them a bath, sing a song, provide them with a light snack and/or have a “cuddle” time. Whatever routine you choose for your child make sure that they know that at the end of this routine the lights will be switched off, and they must go to sleep. Try to keep lights dim towards the end of the day. Dim lights signal to the brain that it is sleep time, whereas the bright lights of morning signal a time to wake up. Try not to put too many toys in your child’s bed, as this can be a distraction. One or two traditional toys such as a doll or teddy bear are sufficient. As tempting as it may be, try not to use bedtime as a threat. Your child will start to see bedtime as a punishment and a negative experience, rather than the secure, loving time that it should be. Television viewing at bedtime has been linked to poor sleep patterns for both younger and older children. Television should be kept to a minimum, and should only be watched earlier in the day. Children, even teenagers, should not have a television or other media such as video games or computer in the bedroom as this can have a negative impact on their sleep. Sleep deprivation – If your child does not get enough sleep it can lead to problems in school and in many other areas of their lives. Parasomnias – These are disruptive (but usually not serious) sleep-related problems such as grinding teeth, bed-wetting, sleep talking, sleepwalking, night terrors etc. These usually occur during partial arousal so the child will seem to be both awake and asleep at the same time. Separation issues – Younger children may feel anxious without a parent being there with them and this can cause difficulty with sleep. This can also affect the parent in which case they may feel the need to check on the child regularly, even when the child does not need them. Night waking – Everyone goes through stages of waking up at night or sleeping more lightly. This only becomes a problem if the child has difficulty in getting back to sleep. Sleep apnoea – This is when there are short pauses in the breathing pattern. If you think that this could be problematic for your child it is best to see a doctor for an evaluation. Remember, letting your child stay up late may make you more popular, but will not do them any favours in the long run. Ensure that your child gets adequate sleep and they will be happier, healthier and will function better in all areas of their lives. Good sleep strategies are the most effective and useful treatment for troublesome sleep problems.